BEIRUT—The Syrian army has effectively put two big towns in eastern Ghouta under siege by advancing into the area linking them to each other and to the rest of the rebel enclave, a war monitor said on Saturday March 10. Syrian state television had earlier reported that army operations were intensifying in the central part of eastern Ghouta three weeks into the government’s ferocious assault. Both the Syrian Observatory for Human Rights, a Britain-based war monitor, and a military media unit run by the government’s ally Hezbollah said the army had captured the town of Mesraba and advanced into surrounding farms. Mesraba lies just south of the large towns of Douma and Harasta along the road linking them to the remaining southern area in the insurgent pocket. The roads connecting the towns to each other were all covered by army fire, the Observatory said. Jaish al-Islam and Failaq al-Rahman, the two main rebel groups in eastern Ghouta, could not be immediately reached for comment. They have said in recent days that they had staged counter attacks taking back some lost positions. The relentless three-week assault on the last major rebel stronghold near Damascus has captured about half its area and killed 976 people, according to the Britain-based Observatory. Syrian state television broadcast live from the edges of eastern Ghouta, showing a massive plume of dark smoke rising behind houses and trees and with the sound of blasts in the background. Syrian President Bashar al-Assad and Russia, his main ally, say the campaign is needed to end rebel shelling of Damascus and to end the rule of Islamist insurgents over the area’s civilians. The offensive follows the pattern of previous assaults on rebel strongholds, deploying massive air power and tight sieges to force insurgents to accept “evacuation” deals. These involve rebels surrendering territory in exchange for safe passage to opposition areas in northwest Syria, along with their families and other civilians who do not want to come back under Assad’s rule. Late on Friday, a small number of fighters and their families from the former al Qaeda affiliate previously known as the Nusra Front left eastern Ghouta under such a deal. The intensity of the government’s attack on an enclave that has been besieged since 2013 and suffers acute shortages of food and medical supplies has drawn Western condemnation and demands by U.N. aid agencies for a humanitarian halt in fighting. “Living conditions are harsh… Shop owners and traders are sending their workers to the shelters to sell food for three times their price before the offensive,” said a man in Saqba who identified himself as Abu Abdo in a voice message. Aid agencies have tried to deliver aid into eastern Ghouta, but they have only been able to bring in a portion of the amount they wanted. A convoy was unable to finish unloading on Monday because of continued fighting, bringing in the remaining undelivered food parcels on Friday despite bombardment nearby. 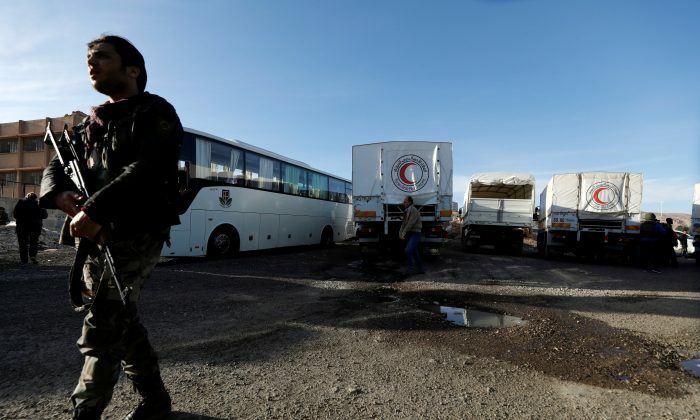 However, U.N. agencies said most medical supplies had been stripped from the convoy by Syrian government officials and added that the food supplies brought in were insufficient. The government has opened what it says are several safe routes out of eastern Ghouta for civilians, but none are known to have left so far and Damascus and Moscow accuse the rebels of preventing them from fleeing the fighting. Insurgent groups in eastern Ghouta deny this, but a Reuters witness on Friday saw gunfire and mortar fire from inside the rebel territory near one of the crossing points.